A trio of analogue-inspired and beautifully designed EQs that successfully shun slavish emulation in favour of modern flexibility. Choice of three EQs. Adjustable valve flavour on two EQs. Visually compelling design. Flexible Pultec-style EQ. Spectrum and curve display could be better. Meagre presets. Positive Grid's efforts to lift hardware emulation to new levels continue with the arrival of its second Pro Series plugin bundle. Much like Pro Series Compressors, Studio EQ (VST/AU/AAX/RTAS) includes three separate plugins (Tube EQ, Digital EQ and Passive EQ) combining component-level emulation with photo-realistic displays. However, apart from some valve component options in the Tube and Passive EQs, Studio EQ shies away from the component-level tweakery available in Studio Compressors. 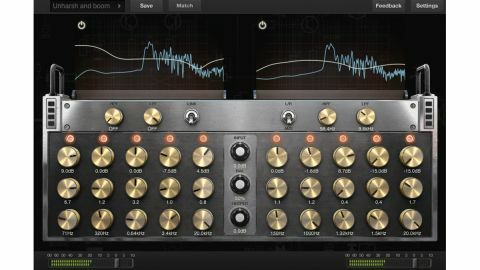 Instead, the unique selling point here (and common to all three plugins) is the take on the match EQ concept. So, what's on offer? Tube EQ and Passive EQ are clearly inspired by classic analogue designs, and you'd be forgiven for thinking that Digital EQ would be a super-flexible DAW-style EQ. However, it's actually more like a discrete or solid-state design. You get two shelves (high and low, with fixed slopes), and three parametric bands between. The three bands are subject to upper and lower limits in centre frequency, but can still overlap to some extent. Frequency selection is continuous with Digital EQ, as opposed to the notched frequencies of Passive EQ and Tube EQ, but maximum gain changes of +/-15dB mean Digital EQ isn't the most powerful of the three. Nevertheless, Digital EQ's adjustable Q on both peak and shelving bands make it a good candidate for a sculpting EQ. Tube EQ's preamp valves deliver a balanced blend of odd and even harmonics. Flexibility continues with either left/right or mid/side operation, and there's also a handy channel Balance control providing either left/ right or mid/side rebalancing. Although not specified, on the spectrum analyser the high-and low-pass filters read as 6dB and 3dB per octave respectively, which is very gentle. Still on the subject of analysis, there's no evidence whatsoever of harmonic distortions, and overall Digital EQ is clearly best suited to master bus or subgroup duties. Tube EQ is the Pultec-inspired EQ of the three models, and it goes beyond the simple EQP-1A design with two pages of controls covering five bands plus low- and high-pass filters (12dB/ octave for each). In fact, on closer inspection, some aspects here drift away from the classic Pultec design, and all told, the choice of frequencies is much wider. It's great to see independent frequencies for the Lo frequency Boost and Attenuation controls, but we miss having a bandwidth control for the Hi peak band, and although there are Bandwidth controls for the three Mid bands (which include two Peak boost and one peak Dip), a 10kHz boost with a choice of bandwidths is not on the cards. Passive EQ is the simplest of the three Studio EQ plugins. Each of its three bands (Bass, Treble and Top) has five shape options (high shelf, low shelf and three peaking), with four band-specific frequencies for each. Even at their narrowest settings, the peaks are quite broad, and the shelves extremely gentle. Even so, with +/-20dB on all bands, it's still powerful, and we particularly like the Baxandall-style shelves for silky-smooth sweetening. Passive EQ and Tube EQ both include optional valve stage emulations. For Tube EQ you get three slightly different preamp valves (12AX7, 12AT7 and 12AU7), and for Passive EQ two typical output stage valves (6L6GB and EL34). How these behave depends on input level, and one can make use of the input sliders (common to all three EQs) to manage gain levels. Passive EQ includes further Input and Output Amplifier controls, providing an extra gain stage to manipulate the distortions. But how does the distortion actually sound? Passive EQ has odd and even distortions dominated by the third harmonic, with the GL6GB marginally more coloured. Meanwhile Tube EQ's preamp valves deliver a more balanced blend of odd and even harmonics. Sonically, this is all good news, and having the option to switch them off provides the best of both worlds, although it may have been simpler to include a gain-compensated drive parameter rather than multiple level controls. From a sonic perspective, all three plugins sound excellent, with the analogue filter EQ matching providing an added bonus. What's more, although spreading the functionality across three individual plugins could feel a bit indulgent, there's enough difference between the EQs to justify it. In spite of this, with only four presets on each plugin, there aren't enough starting points, which is a shame. Beyond this, our only other gripes concern some aspects of the display such as the overall scaling (which seems to stop at a frequency lower than required), the lack of clear scale labelling and its failure to always update the visual curve correctly. Even so, we're confident that Positive Grid will resolve these minor issues quickly, and ultimately, the sound of the plugins is what counts, and that is impressive. All told, this is a good set of plugins that further cements Positive Grid's position as an important and ambitious developer.